Another Beautiful Day in Paradise. It was in the low 70s with a good breeze out of the NE. The wind direction pretty much eliminated heading East or South so we headed North toward Tarpon Springs. The Trail North has some rough sections but wasn't too bad. Absentees Kim, Tom, Delaney, Dee, Herb, Phil and Bruce came. Welcome back. 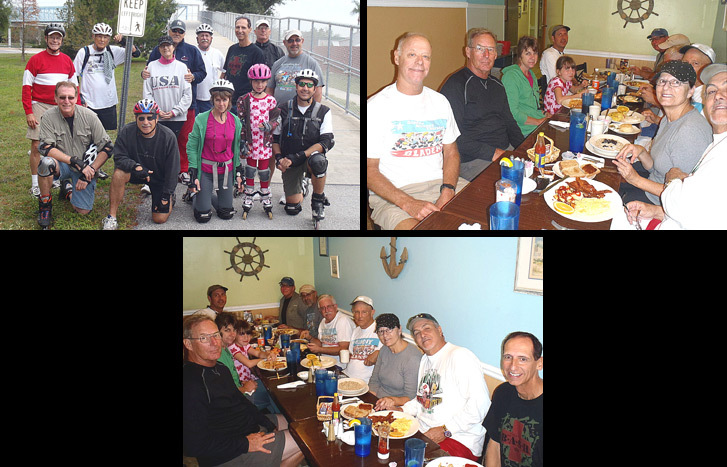 Most of the group made it to Tarpon Springs and back for a round trip of 15 miles. We had 6 bicyclists. Rick and Ginnie renewed their Sponsorship. Thanks for the web site support Rick and Ginnie. We Brunched at Benedict's as planned. They got us right in and seated at a big long table. Coffee flowed fairly good. The food was very good. Rob rated his a 9.5 and some indicated higher.